The dress image and dress mannequin are part of a three piece Framelits set found in the new Stampin'Up Spring mini. The dress was cut from a piece of Designer Series Paper, Sycamore Street which is FREE with each 50.00 merchandise purchase you make from Jan 22 - March 22, 2013. 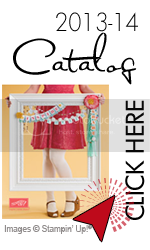 The dress ribbon is one of three that along with buttons are also FREE during the promotion. The mirror is cut with the new oval Framelits also in the new mini. The Brushed Silver paper #100712 is in the main catalog along with the Rich Razzleberry, Pool Party and Very Vanilla used. The front of the card was to resemble clossed doors and was created by stamping the Very Vanilla with Crumb Cake using our largeWoodgrain Stamp #117100. Happy Birthday from Itty Bitty Banners, page 134, stamped in Basic Grey in Vellum and cut from the Bitty Banners Framelits Dies found on page 191. The background paper were run through the Big Shot using the Lace Brocade, #127819. The vellum banner was applied with glue dots which barely show. Unfortunitely, my camera and lighting made the clear rhinestones look golden. They are silver in person. The flower was punched from Rich Rapplebery using one of the cute Itty Bitty Shapes Punch Pack. Fancy Fan Folder #127751 was used to create the texture of the Rich Razzleberry card stock. A beautiful card, Barbara - awesome fold. But more than anything, I especially like your attention to details on this card -- the magical mirror, pretty belt, sparkly necklace, wallpapered dressing room -- all so pretty!